NEW YORK — Looking to keep the kids entertained during long holiday car rides or dinners? Tell all your gift-buying elves to wrap up a book. 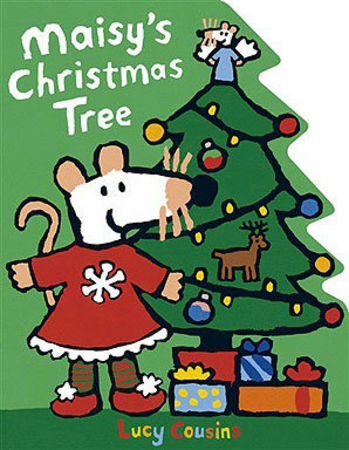 “Maisy's Christmas Tree,” by Lucy Cousins: Maisy the mouse and pals Cyril and Tallulah prepare for the holiday, from trimming the tree to singing carols. One side of the book is cut out in the shape of a tree, something little ones might appreciate. Candlewick Press, ages 2-5. 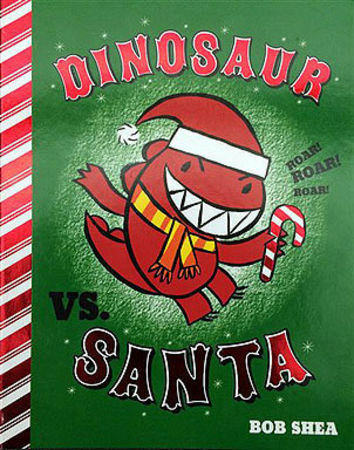 “Dinosaur vs. Santa,” by Bob Shea: A smiley little dino wears a bright orange snowsuit, makes gifts for his parents and sneaks downstairs on Christmas Eve only to scurry back to bed due to someone in red ho, ho, ho-ing in the dark. Disney-Hyperion, ages 3-5. “Pete the Cat Saves Christmas,” created and illustrated by James Dean, story by Eric Litwin: In this retelling of “The Night Before Christmas,” the can-do kitty is called upon to deliver gifts when Santa falls ill. The feline's “minibus flew, just like in a movie” and “Pete the Cat cried, ‘This is totally groovy! '” Harper, ages 4-8. “Here Comes Santa Cat,” by Deborah Underwood, pictures by Claudia Rueda: There are jet pack mishaps and dead fish gifts for children as a wily but mute cat holding placards on sticks to communicate impersonates Santa Claus to ensure he gets a gift after a particularly naughty year. Dial Books for Young Readers, ages 3-5. “Blizzard,” by John Rocco: based on Rocco's childhood experience during the blizzard of 1978, when 40 inches of snow fell on his Rhode Island town. From the first flake right before recess to delivering groceries via sled on day six and the arrival of snowplows. Disney-Hyperion, ages 3-5. “The Animals' Santa,” by Jan Brett: Meticulously drawn forest creatures await the arrival of this special Santa. The animals recall gifts of Christmases past. There was a puzzle for the crows hanging from their tree branch and a brush to fluff his tail for the arctic fox. A magnificent finish from the beloved Brett with a snowy owl in a starry Santa's cap and a basket full of booty strapped to his breast. G.P. Putnam's Sons, ages 3-5. 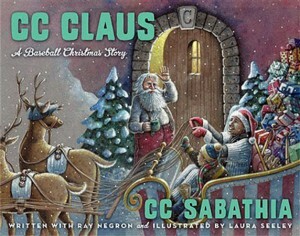 “CC Claus: A Baseball Christmas Story,” by CC Sabathia, written with Ray Negron, pictures by Laura Seeley: Star Yankees pitcher CC Sabathia enlists the help of George Steinbrenner and baseball stars of yore to help two boys in need of balls and gloves for Christmas after their letter to Santa lands in Sabathia's fan mail. Ecco, ages 5-up. “Star Bright: A Christmas story,” by Alison McGhee and Peter H. Reynolds: The newest angel, a girl in a pilot's cap and goggles, tries to come up with a gift for baby Jesus. She hurtles down to Earth and becomes the star that lights up the night sky. The book contrasts a futuristic heaven with old-world illustrations for the birth of Jesus. Atheneum, ages 4-8. “A Little Women Christmas,” by Heather Vogel Frederick, pictures by Bagram Ibatoulline: This adaptation of a portion of Louisa May Alcott's “Little Women” is a good introduction to the March family. Mother and the girls are alone for the holiday while Father recuperates in a hospital after hard service as a Union Army chaplain. Jo has cut off her hair to earn money as she vows there WILL be gifts. Simon & Schuster, ages 4-8. A gifty set of hardcovers with colorful, textured bindings. Includes “A Little Princess,” ”Anne of Green Gables,” ”The Adventures of Huckleberry Finn,” ”The Secret Garden,” ”The Wind in the Willows” and “Peter Pan.” Puffin Classics, ages 8-up.